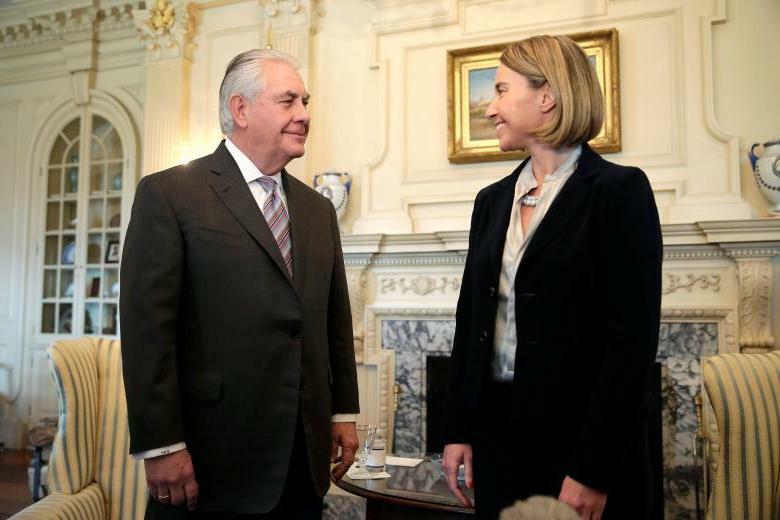 European Union High Representative for Foreign Affairs Federica Mogherini met Secretary of State Rex Tillerson. The incoming Trump administration inherits a U.S.-Russian relationship marked by disagreement and confrontation in the wake of Russia’s annexation of Crimea, the wars in Syria and Ukraine, the West’s use of economic sanctions, and reciprocal complaints about interferences in domestic affairs. The arms control dialogue is stagnating, and the risk of conflict, whether by intent or miscalculation, is growing. From a European perspective, the current confrontation between NATO and Russia and the question of how to preserve the post-Cold War peace in Europe should be a prime concern for the new administration. For President-elect Donald Trump, U.S. commitments to allies might hinge more on transactional considerations than on shared values. That might open up requirements for deeper integration of defense planning and spending among European allies. It also offers the chance for a fresh start on Russia, not in the sense of a bilateral “reset” but in terms of formulating a more focused U.S. strategy toward Russia that recognizes the unpleasant political realities, reminds Moscow of U.S. NATO security guarantees, and avoids possible escalation with Russia. Trump and Russian President Vladimir Putin, however, have each displayed proclivities that could worsen relations between the two nuclear powers. To avert the more dire outcomes, the new administration should start by reassessing the fundamental Russian and U.S. interests in Europe. Throughout the last 20 years, Russian leaders have made it abundantly clear that they object to NATO enlargement. As far back as 1997, Boris Yeltsin, the first post-Soviet president, warned that “the eastward expansion of NATO is a mistake and a serious one at that.”1 Since 2008, Moscow in addition has made public its claim to “regions in which Russia has privileged interests.”2 Even though the Kremlin has never clearly specified what that means and to which countries it pertains, it would seem to include all non-NATO post-Soviet states. 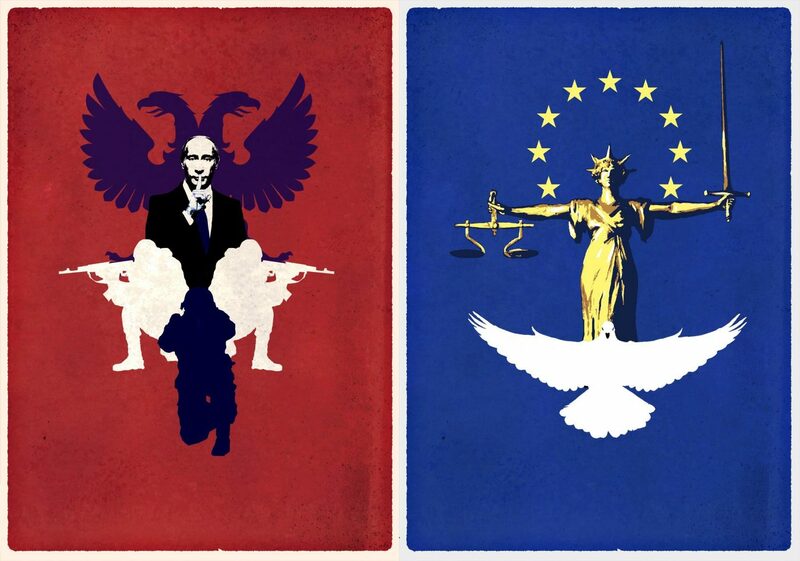 Combining these two principles, it becomes clear that any enlargement of Western institutions, be it NATO or the European Union, runs counter to Russian interests. In order to assert its interests, Russia relies on a strategy of creating a “belt of insecurity and instability” along its southwestern periphery.3 What first sounds illogical from a Western perspective, because stability and security are viewed as inherently worthwhile interests, can only be understood by considering the Kremlin’s perspective. 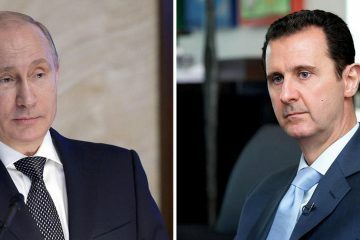 The Russian leadership does not see its foreign policy as “revanchist” or seeking to reverse territorial losses, as it is often described in Western accounts. Instead, it sees Russia as a status quo power that always had special interests in the post-Soviet space and the West, above all the United States, as a status quo challenger. The Russian leadership fights this battle in two geographic theaters and with different means. The first is the post-Soviet space. Here, the Kremlin is only in a stronger position versus the West if it employs force as it did in Georgia in 2008, Crimea in 2014, and in eastern Ukraine currently. All three cases are forms of direct coercion that are also aimed at deterring other post-Soviet states from drifting toward the West. In the second theater, comprised of NATO member states, Russia is very much disadvantaged. Because of its comparative weakness, Moscow uses the tactics of cross-domain coercion5 and asymmetric responses below the level of open kinetic hostilities. 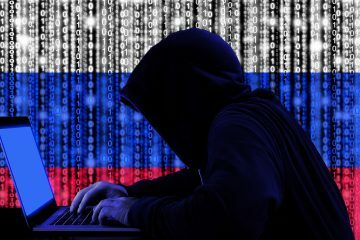 Cross-domain coercion means that the Kremlin extends its struggle to all possible domains with the aim of dragging the West into a constant low-level conflict in the hope of manipulating its calculus toward accepting Russia’s claims, a tactic also known as “coercive gradualism.”6 This includes frequent NATO airspace violations, close military encounters over the Baltic and Black seas, cyberattacks, disinformation campaigns, and support and financing of populist movements in NATO states. NATO member states and the U.S. strategic community are not unified in their assessment of the nature and purview of Russian interests. Is the Kremlin trying to militarily roll back U.S. influence, even in NATO member states? Much depends on what answer is formulated to this question, particularly regarding NATO’s most vulnerable members, the Baltic states. The Obama administration answered that question by inference and opted to reassure the Baltic states—Estonia, Latvia, and Lithuania—and Poland by low-key military commitments. As part of the European Reassurance Initiative, Washington is in the process of sending one armored brigade combat team of 4,000-5,000 personnel to rotate continuously through eastern Europe, prepositioning additional war-fighting equipment in western Europe, and improving air fields and bases. In addition, U.S. forces will lead a multinational battalion of approximately 1,000 personnel in northeast Poland. Those measures can hardly be viewed as threatening Russia’s conventional regional superiority in its vast Western Military District, where some 300,000 military personnel are deployed, or as a serious attempt at deterrence by denial. Yet, if the Trump administration comes to a different assessment or if Russia were to increase its conventional forces along the Baltic borders, Washington would basically have to multiply its current military commitment or push allies to step in on behalf of the United States. One of NATO’s concerns is securing supply routes in times of an imminent threat. Even though the three Baltic states and Poland have just started the process of connecting their countries with a uniform railway system, NATO’s Very High Readiness Joint Task Force, as well as additional military equipment, would have to be transported by air or shipped by sea during the coming years. Complicating the situation, Russia has increasingly invested in a sophisticated network of “anti-access/area denial” (A2/AD) deployments, causing concern that Moscow could block sea and air routes.14 Because NATO officials are taking the Russian A2/AD capability seriously, Poland ordered 40 highly capable, stealthy Joint Air-to-Surface Standoff Missiles (JASSM) for its F-16 fighter-jet fleet and is reportedly in the process of purchasing 70 JASSM cruise missiles with extended ranges of more than 900 kilometers.15 Those missiles can be considered a significant improvement in NATO’s overall capabilities to hold Russian A2/AD assets at risk. The Russian A2/AD deployments notably are not aimed exclusively at suppressing NATO supply routes. They also serve the legitimate Russian interest of defending Kaliningrad, Russia’s enclave on the Baltic Sea, in a scenario where NATO would be the attacker. The United States faces the question of how to deal with Russia’s nuclear signaling. Some U.S. experts continue to urge NATO to answer the Russian actions.16 They refer to the alleged Russian doctrine of “escalate to de-escalate,” meaning that Russia could employ limited tactical nuclear weapons strikes in order to signal resolve in a conventional confrontation. Their concern is that Russia could present NATO with a fait accompli that the alliance, even if it desired, could not counter. In order to “close the credibility gap,”17 they call on NATO to increase the readiness levels of its forward-deployed nuclear assets in Europe, begin integrating conventional and nuclear forces in its exercises again, and further strengthen its declaratory nuclear policy. In fact, the United States is already spending large amounts to increase the perceived utility of its nonstrategic nuclear forces based in Europe through development of a modernized gravity bomb and modernized aircraft to deliver it. Calling on NATO to close the credibility gap appears to be an echo of the Cold War debate about Soviet attempts to decouple Western Europe from U.S. nuclear guarantees. For the time being, however, it seems that Moscow is much more convinced by U.S. guarantees than are some Western strategists. Further, there is not much in terms of official Russian documents, posture, or exercises that support the hypothesis of a Russian escalate to de-escalate doctrine confined to Europe.18 In fact, most of the more recent Russian maneuvers end with a simulated strategic nuclear strike.19 The Russian silence about the alleged doctrine appears to signal first and foremost unpredictability, which would fit into the general pattern of ambiguous behavior. The new U.S. administration must also consider how much control of the post-Soviet space matters to essential U.S. interests. The outgoing administration did not bow to calls20 for arming Ukraine. Instead, it ceded the diplomatic initiative to Germany and France and pushed the EU to join sanctions on Russia. This policy has harmed the Russian economy and resulted in a protracted, low-level conflict in eastern Ukraine. Washington is basically confronted with a formidable dilemma. The United States has to try to dissuade Russia from further violating the post-Cold War European security order and to ensure that every country has the sovereign right to choose its economic, political, and military arrangements. Yet, U.S. leverage is limited, and the Kremlin has already de facto achieved its main goal, that is, a halt to further NATO/EU enlargement into the post-Soviet space. Revisiting the issue of arming Ukraine might make matters worse. Moscow has proven its determination to go to great lengths to prevent Ukraine from regaining control over the Donbas region. Although it could provide more lethal weapons to Kiev, the United States would be likely to end up in a proxy war with Russia, a scenario where Moscow’s incentive to prevail would exceed Washington’s. Moreover, the people of Ukraine would pay most of the humanitarian costs of a full-fledged war with Russia, and the already struggling EU could be confronted with yet another wave of refugees. Although it is too soon to know how the Trump administration will approach Russia and Europe, it is possible to identify challenges he will encounter and offer recommendations on how to meet them. As some of his remarks suggest, Trump could end up giving the Kremlin what it wants, that is a bilateral modus vivendi of noninterference in the mutual spheres of privileged interest, meaning NATO territory here and the post-Soviet space there, while pressuring NATO allies to pay more of the defense burden. This is highly problematic for NATO member states and for some members of the U.S. Republican establishment for a number of reasons. • Further accommodating Russia might be perceived in Russia and other states as rewarding international aggression. The Kremlin could misread any such decision as a sign of U.S. weakness and an opportunity to exert more military pressure. • The consensus among U.S. policy-makers and particularly Republican-leaning experts is that the United States is militarily superior to Russia, although some argue that gap is closing, and that concessions should not be granted to a weaker opponent, in particular when that opponent is actively challenging U.S. interests. • Any such understanding would risk alienating European NATO members that feel most threatened by Moscow, potentially splitting the alliance. • Further, a European settlement on Russian terms, in combination with conditioning U.S. defense commitments, may create negative ripple effects in other parts of the world, most obviously in Northeast Asia, where U.S. allies could start fundamentally questioning U.S. extended deterrence guarantees. Alternatively, Trump, heeding advice from Republican foreign policy hawks, could decide to show he can drive a harder bargain than his predecessor, President Barack Obama.Trump’s latest remarks about his readiness to engage in nuclear arms races could point in that direction.23 In that case, U.S. pushback against Russia could entail regular U.S. exercises close to Russian airspace, more explicit threats of U.S. nuclear weapons use, cyberattacks against Russian infrastructure, and the unilateral abrogation of arms control agreements such as the New Strategic Arms Reduction Treaty (New START), the INF Treaty, or the NATO-Russia Founding Act, the 1997 political accord that conditionally bars the permanent deployment of substantial NATO combat forces to central and eastern Europe. Such actions would present problems not only to Russia but also to Washington and its NATO allies. • Given Trump’s past erratic comments and the fact that the United States already has the most powerful military in the world, Moscow might feel very much threatened. It could prompt Russia to backpedal in order to de-escalate. Alternatively, the Kremlin may misperceive those signals as signs of U.S. offensive intentions and take countermeasures. Russia could even double down, resulting in a risky security dilemma that would be almost impossible to manage. • NATO member states might disagree on the logic and expected payoff of such a strategy, creating a schism that threatens alliance coherence. • Loose nuclear talk would undermine long-standing principles and norms of international conduct and thus create negative ripple effects beyond the immediate U.S.-Russian relationship, damaging the international reputation of the United States. There is the possibility that not much changes in U.S.-Russian relations, particularly given Trump’s predisposition to “make America great again” by focusing attention and resources on domestic problems. In that case, the administration would be well advised to prioritize its responses in Europe. Paramount priority must be given to the safety and security of NATO member states and making sure that NATO maintains a unified position. Protecting Ukraine is a related but subordinate interest and should be handled in close coordination with European allies. The best way to deal with Russia is to remain calm and patient. In this regard, a good personal relationship between Trump and Putin might be helpful. Washington has already underscored its commitment to NATO’s easternmost members. It should continue to do so through regular and visible high-level visits, consultations, and affirmations of U.S. commitment to NATO’s Article 5 collective defense provision. If the Trump administration feels that some allies are not meeting their defense spending obligations, it should seek ways to encourage deeper military integration, cooperation, and defense planning among European NATO members. In addition, Washington could consider prepositioning additional military equipment in western Europe. The Trump administration should be ready to publicly denounce Russian nuclear signaling and intimidation attempts whenever they occur. Washington should seek the broadest international support possible for doing so. Given the high probability of misperceptions and misunderstandings and the Russian strategy of drawing NATO ever deeper into a nonkinetic conflict, Washington should exercise restraint. If Russia is not significantly increasing its military presence along the Baltic borders or the Black Sea periphery of NATO, Washington should not give it an excuse to do so. Instead, it should invest more time in diplomatic efforts to assure allies and lower tensions with Russia. The United States should leave NATO’s nuclear component untouched, avoid too much declaratory drivel, and leave the Russians in the dark instead. The United States should not arm Ukraine. Russia will be able to counter militarily almost every step taken. Instead, Washington and its allies should provide Kiev with much more economic support. The gravest political threat to the current leadership in the Kremlin is a prosperous and economically thriving Ukraine. 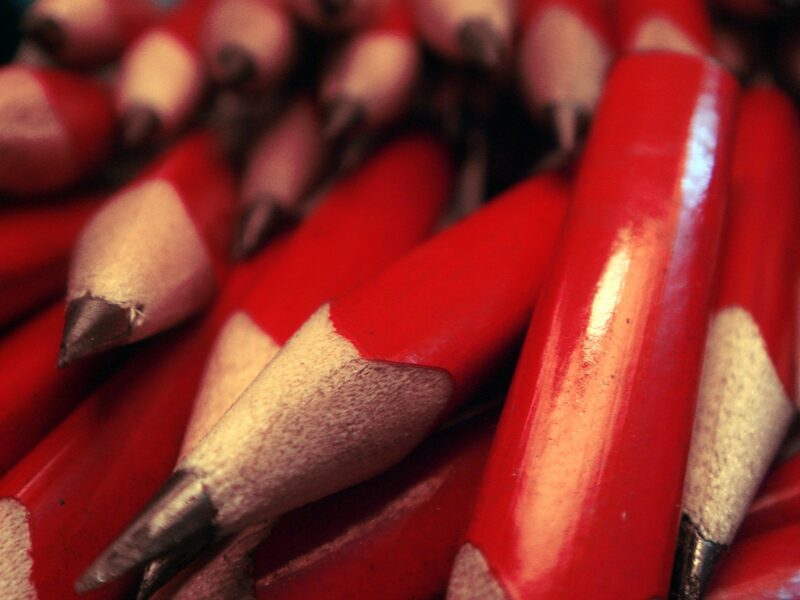 A cost-saving approach to defense lies in the realm of resilience. Washington should do everything possible to strengthen the resilience of the Baltic states. An eastern Ukraine-like scenario is only likely if their Russian minorities feel deeply disenfranchised or alienated. The United States therefore should keep a close watch on the state of educational, language, cultural, informational, anti-corruption, policing, and rule of law policies and should offer its help in a proactive manner. On the sanctions policy, Washington should ensure the EU keeps firm because this is one of the only real forms of leverage the West possesses. All this does not bode well for the bilateral arms control agenda. 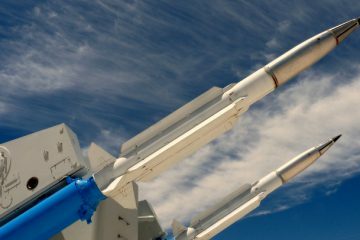 Arms control policies are built on certain recognition that preserving the status quo is beneficial. The United States and Russia, however, view each other at present as challenging the status quo. The fact that Russia reaps benefits from its unpredictable behavior makes it necessary to change the Russian calculus so that Moscow views the gains from cooperation as outweighing those from confrontation. Yet, that would mean that Washington would have to be willing to offer something significant that goes beyond the immediate arms control goals of predictability, stability, and transparency. An unofficial recognition of spheres of privileged interest, together with a more respectful relationship under Trump, could be something that interests Putin. Nevertheless, the widely shared disdain for arms control among many Republican policymakers would certainly work against a serious U.S. arms control push. Much depends on Russian intentions. The agreement to address compliance issues by convening the INF Treaty’s Special Verification Commission in November for the first time in 13 years was a positive development. Yet if Moscow continues down the current path of producing and perhaps deploying new INF Treaty-range weapons, Europe risks entering a new Cold War “Euromissiles” crisis, awakening some of the turmoil encountered during the 1970s and 1980s. If the Russian rationale is really based on fear of a decapitating strike, U.S. officials could consider options to reassure Moscow about the Aegis Ashore launchers deployed in Romania, such as technical consultations and site visits, demonstrating to Russian experts that the United States is ready to undergo hardware changes that make it technically impossible for these launchers to fire Tomahawk cruise missiles. If much of Russia’s concern stems from third-country nuclear and conventional missiles within the INF Treaty range (e.g., China’s capabilities), Washington and Moscow can consider reviving a 2007 UN General Assembly initiative put forward by Russia and supported by the United States that called for a multilateralization of the INF Treaty. Putin’s latest remarks seem to point in that direction.29 In this way, both sides could take account of emerging technologies and the changing geopolitical landscape, which no longer may be resolved in the traditional bilateral manner. Even though both sides can extend New START for another five years, the U.S. Senate will most likely not give its advice and consent to any follow-on agreement absent a resolution of the INF Treaty issue. The Trump administration might even use Russian noncompliance and nuclear modernizations as reasons to opt out of New START implementation. Moscow might be ready to go down that road as well. A follow-on agreement to New START is important, particularly in order to understand both sides’ nuclear modernization activities, to preserve transparency, to prevent backsliding into arms race instability, and to convince non-nuclear powers that Russia and the United States take seriously their nuclear Nonproliferation Treaty obligations to pursue nuclear disarmament. Washington and its European allies will need to remind Moscow that, without INF Treaty compliance, further strategic nuclear dialogue and a New START follow-on may be impossible, closing off Russia’s most productive path toward preserving its influence and enhancing its security. Therefore, the new U.S. administration should engage with Moscow as early as possible on arms control issues. It needs to remind the Kremlin that respect for Russia will be influenced by Russia’s respect for mutual security. It also needs to remember that existing problems will not go away by acting as if arms control talks are a reward for Russia. The reality is just the opposite: arms control talks are in the genuine national interest of all parties—the United States, Russia, and the international community. 1. Thomas W. Lippman, “Clinton, Yeltsin Agree on Arms Cuts and NATO,” The Washington Post, March 22, 1997. 2. Charles Clover, “Russia Announces ‘Spheres of Interest,’” Financial Times, August 31, 2008. 3. This belt stretches from the conflict between Armenia and Azerbaijan over Nagorno-Karabakh, which Russia fuels and manages at the same time through arms sales and political pressure; along the protracted, open conflicts in Georgia, Ukraine, and Moldova; over the pro-Russian, authoritarian-ruled Belarus; and up to the Baltic states, Poland, and the Scandinavian countries, the latter of which Russia has also repeatedly intimidated throughout the last two years. 4. President of Russia, “Meeting of the Valdai International Discussion Club,” October 27, 2016, http://en.kremlin.ru/events/president/news/53151. 5. Dmitry (Dima) Adamsky, “Cross-Domain Coercion: The Current Russian Art of Strategy,” Proliferation Papers, No. 54 (November 2015), https://www.ifri.org/sites/default/files/atoms/files/pp54adamsky.pdf. 6. William G. Pierce, Douglas G. Douds, and Michael A. Marra, “Understanding Coercive Gradualism,” Parameters, Vol. 45, No. 3 (Autumn 2015): 51-61. 7. Lidia Kelly, “Russia Can Turn U.S. to Radioactive Ash – Kremlin-Backed Journalist,” Reuters, March 16, 2014. 8. Adam Withnall, “Vladimir Putin Says Russia Was Preparing to Use Nuclear Weapons ‘If Necessary’ and Blames U.S. for Ukraine Crisis,” The Independent, March 15, 2015. 9. The end of the most recent Kavkaz (South) 2016 exercise coincided with the Russian military test-firing a modernized Topol intercontinental ballistic missile. Pavel Felgenhauer, “Russian Military Resists Proposed Budget Cuts, Prepares for Major Ground War,” Eurasia Daily Monitor, September 15, 2016, https://jamestown.org/program/russian-military-resists-proposed-budget-cuts-prepares-for-major-ground-war/#sthash.Jmzv79tt.dpuf. 10. Alexei Anishchuk, “Don’t Mess With Nuclear Russia, Putin Says,” Reuters, August 29, 2014. 11. Dmitry Solovyov and Lidia Kelly, “Russia Warns of Retaliation as NATO Plans More Deployments in Eastern Europe,” Reuters, May 4, 2016. 12. Anna Maria Dyner, “Russia Beefs Up Military Potential in the Country’s Western Areas,” PISM Bulletin, No. 35 (885) (June 13, 2016), http://www.pism.pl/publications/bulletin/no-35-885. 13. Elbridge Colby and Jonathan Solomon, “For Peace With Russia, Prepare for War in Europe: NATO and Conventional Deterrence,” War on the Rocks, April 20, 2016, http://warontherocks.com/2016/04/for-peace-with-russia-prepare-for-war-in-europe-nato-and-conventional-deterrence/. 14. 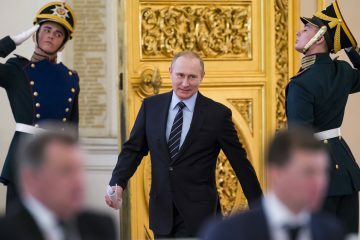 Giulia Paravicini, “New Chess Game Between West and Russia,” Politico, July 1, 2016, http://www.politico.eu/article/natos-struggle-to-close-defence-gaps-against-russia-a2ad/. 15. Ben Judson, “Poland Wants Extended-Range JASSM Missiles,” Defense News, November 29, 2016. http://www.defensenews.com/articles/poland-wants-extended-range-jassm-missiles. 16. Matthew Kroenig, “Facing Reality: Getting NATO Ready for a New Cold War,” Survival, Vol. 57, No. 1 (2015): 49-70. 17. Jacek Durkalec and Matthew Kroenig, “NATO’s Nuclear Deterrence: Closing Credibility Gaps,” The Polish Quarterly of International Affairs, Vol. 12, No. 1 (2016): 37-50. 18. Olga Oliker has illustrated that in a very detailed and convincing study. Olga Oliker, “Russia’s Nuclear Doctrine: What We Know, What We Don’t, and What That Means,” Center for Strategic and International Studies, 2016, https://csis-prod.s3.amazonaws.com/s3fs-public/publication/160504_Oliker_RussiasNuclearDoctrine_Web.pdf. 20. Ivo Daalder et al., “Preserving Ukraine’s Independence, Resisting Russian Aggression: What the United States and NATO Must Do,” Atlantic Council of the United States, February 2015, https://www.brookings.edu/wp-content/uploads/2016/06/UkraineReport_February2015_FINAL.pdf. 21. Maggie Haberman and David E. Sanger, “Transcript: Donald Trump Expounds on His Foreign Policy Views,” The New York Times, March 26, 2016. 22. Nick Gass, “Trump Tries to Clean Up on Crimea,” Politico, August 1, 2016, http://www.politico.com/story/2016/08/trump-clarifies-crimea-ukraine-226497. 23. Michael D. Shear and David E. Sanger, “Trump Says U.S. Would ‘Outmatch’ Rivals in a New Nuclear Arms Race,” The New York Times, December 23, 2016. 24. Among those could be the 1972 agreement on the prevention of incidents on and over the high seas and the 1989 agreement on the prevention of dangerous military activities. For the recommendations of the Deep Cuts Commission on the creation of a Joint Military Incident Prevention and Communications Cell with a direct telephone link to the U.S. Joint Chiefs of Staff, the Russian General Staff, and SHAPE, see Deep Cuts Commission, “Back From the Brink: Toward Restraint and Dialogue Between Russia and the West,” Institute for Peace Research and Security Policy, June 2016, p. 17, http://deepcuts.org/images/PDF/Third_Report_of_the_Deep_Cuts_Commission_English.pdf. 25. I am grateful to Josh Pollack for the Matryoshka doll metaphor. 26. Bureau of Arms Control, Verification and Compliance, U.S. Department of State, “2016 Report on Adherence to and Compliance With Arms Control, Nonproliferation, and Disarmament Agreements and Commitments,” April 11, 2016, http://www.state.gov/t/avc/rls/rpt/2016/255651.htm. 27. Michael R. Gordon, “Russia Is Moving Ahead With Missile Program That Violates Treaty, U.S. Officials Say,” The New York Times, October 19, 2016. 28. Russian Ministry of Foreign Affairs, “Comment by the Information and Press Department on the U.S. Department of State’s Report on Adherence to and Compliance With Arms Control, Nonproliferation, and Disarmament Agreements and Commitments,” April 15, 2016, http://www.mid.ru/en/foreign_policy/news/-/asset_publisher/cKNonkJE02Bw/content/id/2237950. 30. John R. Bolton and John Yoo, “An Obsolete Nuclear Treaty Even Before Russia Cheated,” The Wall Street Journal, September 9, 2014. Czech elections: it might not be the economy, stupid!